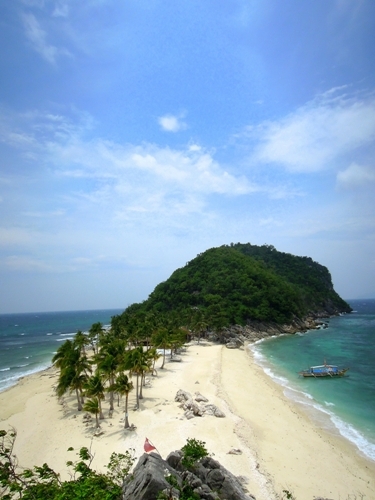 The view that made me want to travel to Islas de Gigantes in the first place. Breakfast was served after our sunrise tour at the North Gigantes Lighthouse. As expected, the cook surprised us with yet another variation of Scallops, breaded and deep-fried this time. By 9am, our group was already crisscrossing the rough seas onto our first stop, Cabugao Gamay Island. Perhaps the most photographed spot in Islas de Gigantes, Cabugao Island is famous for its clear waters, white sand beaches, lush trees and majestic rock formations. Climbing all the way to the top of the cliff is definitely worth the time and effort if you wish to get the best view of the islet. Accessible only during low-tide, Bantigue Island Sandbar is a long stretch of white sand in the middle of the ocean. The sand may not be as fine as in Cabugao Island but this is where we had a great time swimming as the waves is not as harsh as in the other islands. The rocky shoreline in the far end of the island is also a favorite spot among photography enthusiasts. Snorkeling, dining by the beach, camping, beach volleyball and water sports activities like jet ski and banana boat are only some of the things you can do in Antonia Island Resort. 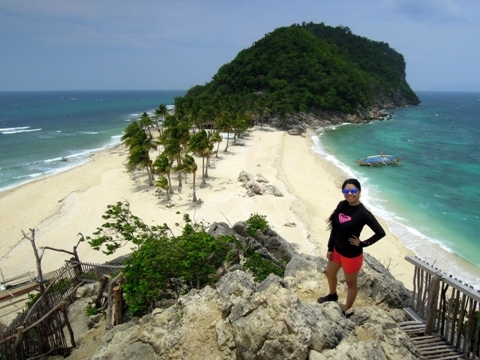 In fact, it was the only island that had a resort-like feel among all the islands in Gigantes. Antonia Island is also known for its colorful marine life and amazing coral reefs which we failed to explore because of the strong waves crashing into the rocks, quite a frightening sight if I may add. There are so many places I have yet to explore in Islas de Gigantes like spelunking at Bakwitan Cave and the famed Tangke Salt Water Lagoon that was unsafe and inaccessible to swim into because of the high tide and strong current. I am definitely coming back next summer!